Home » Food » Reviews » Dietitian's Day! Who's yours? Click here to read about the first time I met my dietitian, Rebecca Scritchfield. 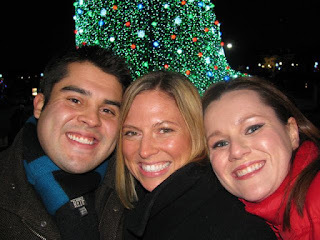 Like I said in my guest post for DubyaWife, there are people that come into your life that remind you what's really important on this whole weight-loss/health-gain journey -- and Rebecca was one of them. So on this Registered Dietitian's Day, I just want to thank her for her professional wisdom and personal friendship. She taught me that relationships with humans are better than relationships with kitchen appliances. She taught me that I can eat what I want -- it's all about balance and savoring what I eat. She helped me see that it's okay to make mistakes, but that the sooner I right myself, the less damage done. 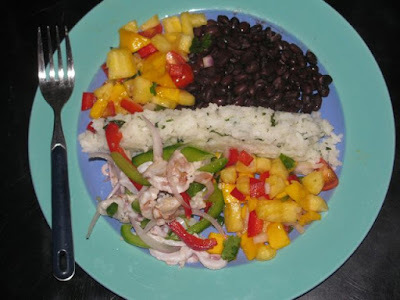 In other news, I had some fun cooking tonight -- ceviche, pineapple/mango salsa, black beans and cilantro-lime rice. How do you food bloggers do it? I couldn't wait to dive in and eat my dinner!